Netanyahu takes part in memorial ceremony at Ponar, where 70,000 Jews were murdered and shares little known family story. Prime Minister Binyamin Netanyahu took part today (Friday) in a memorial ceremony at Ponar, in Vilnius, where 70,000 Jews were murdered during the Holocaust, and shared a little-known family story. 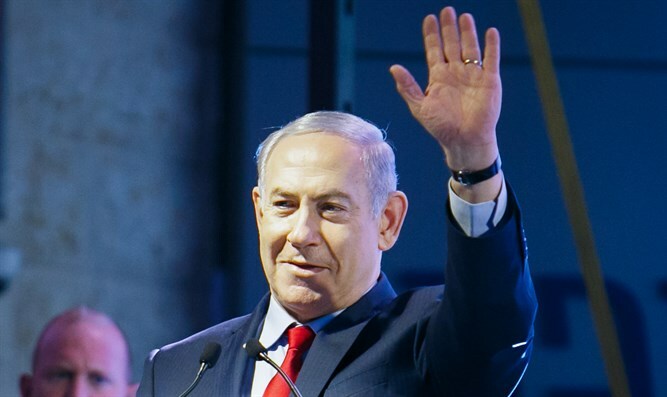 Among other things, Netanyahu said: "I am here because over 100 years ago, my grandfather, who was a young yeshiva student, was beaten almost to death, in a location not far from here, by anti-Semitic hooligans. "Before losing consciousness, he said – 'If I survive, I'll take my family to the Land of Israel, so that we can rebuild our independent lives, so that we can continue the heritage of the brave Maccabees. We will defend ourselves." "An unforgettable tragedy took place here," Netanyahu said. "An unforgiveable crime was perpetrated. About 70,000 Jews were murdered in cold blood by the Nazis and their collaborators, and 30,000 non-Jews were also murdered." "All in all, 200,000 Jews were murdered here and in other places in Lithuania – 95% of the Jews who lived in this country," said the prime minister. "Before the Holocaust, Vilnius was a large center of Jewish study and knowledge (or enlightenment – ed. )," he continued. "It was known as 'Lithuania's Jerusalem.' Standing here today, we remember all those who were annihilated and all that was destroyed. We remember the extraordinary strength of those who survived." Netanyahu also mentioned the Lithuanian heroes who – "unlike the collaborators" – risked their lives and those of their families to save Jews.